Don’t you hate bookkeeping and paper work? Wouldn’t you rather just play with your dice some more? Well now we have a great solution! 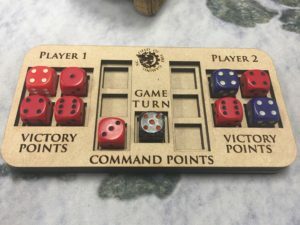 This turn counter will use your dice to help you keep track of the score, what turn it actually is, and who still has command points. Don’t end your Warhammer 40k games with an argument about who scored what! This product ships in three separate pieces. Each piece is covered in a protective wax paper. Be sure to remove the wax paper before gluing the turn tracker together! We recommend Gorilla wood glue. Simply apply a thin layer and then either clamp together or put between the heaviest books you have! Add as many dice as you like individually or buy in packs of 10 or 25 for some better savings! Play the freaking objectives! 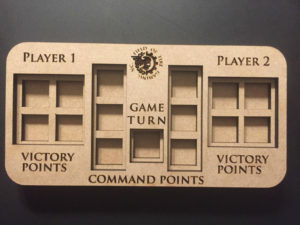 Numbered from 1-6, in roman numerals no less, our objective markers keep you focused on winning the game not just killing your opponent's favorite toys. Welcome to the Danger Zone! Or... you know, stay out of it if you're deepstriking. You get the point. 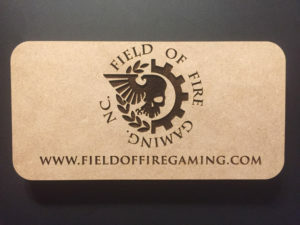 Our laser etched danger zone markers are exactly 9" long to help keep measuring deepstike distances fair and easy. They also have a handy 1" and 2" marking along the short edge. Don't let constant measuring slow down your game, show your opponent the danger zone! Alright, we're done saying danger zone now.